Anyone who knows me, knows that my dog, Cola means the world to me. And anyone who knows Cola, knows that he has a very interesting little personality on him. He loves TV, he loves Facetiming and he poses quite well for photos. But, one thing I am starting to notice is that perhaps he also knows when I am low. Now, Cola is trained but to a minimal. He obviously knows to sit, go to the door to go outside & pee and all the basics of dog training. I have never trained him to do anything diabetes related as far as alert me when I am low etc. But I am starting to notice that Cola always seems to wake me up when I am low or at least assist me when I am low and maybe it is just a fluke, but regardless it makes me smile. I do not rely on this method of care. I often feel my lows but sometimes when I wake up low I'll sit and stew over it for awhile before I take action (that's my low brain working at a minimal level). In the past year Cola has been the one to either pounce on me, or come up to the bed and wake me up by barking or jumping on top of me, and every time I have been low. Majority of the time I knew I was low but was stewing over it, and as soon as Cola drew attention to it, I decided to as well. Last night I was in bed and woke up because I felt low. I have had a lot of lows in the night, but I was just so exhausted I laid there and thought about how I was feeling. Just then Cola appeared who was downstairs watching TV with M. He didn't jump on the bed to sleep but rather came up alongside the bed and pushed his face against me. "Okay Cola, I'll go check." I came downstairs, Cola happily trotting behind me and checked 3.0 mmol/L. I couldn't believe it and even M was amazed at how Cola abruptly left him to go check on me. And maybe he wasn't, but it's hard to overlook such a fluke. Regardless what this says to me is that dogs can sense our energy and they're such amazing creatures. I'm happy Cola is checking up on me, and almost always sitting with me while I treat myself. 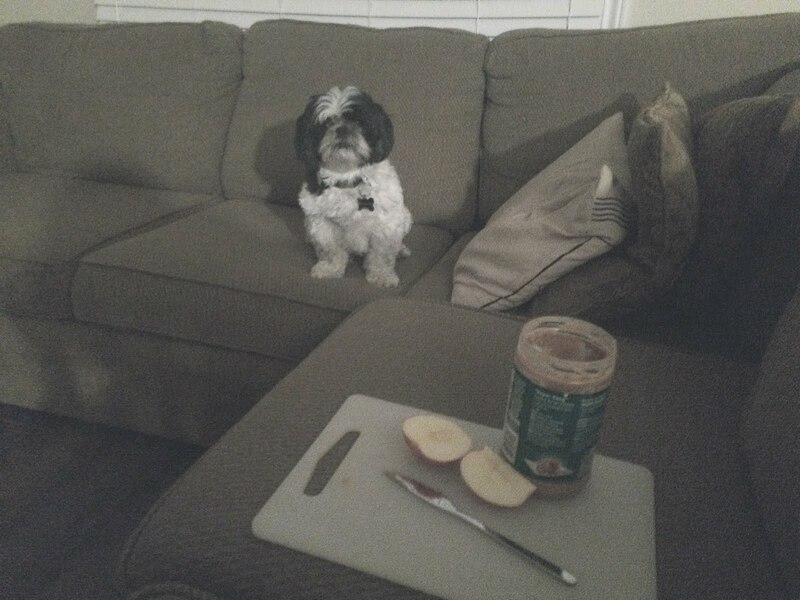 He has kept me company many of nights while I stuffed my face with peanut butter and apples, yet never begging for a piece.